Are these gorgeous or what?! 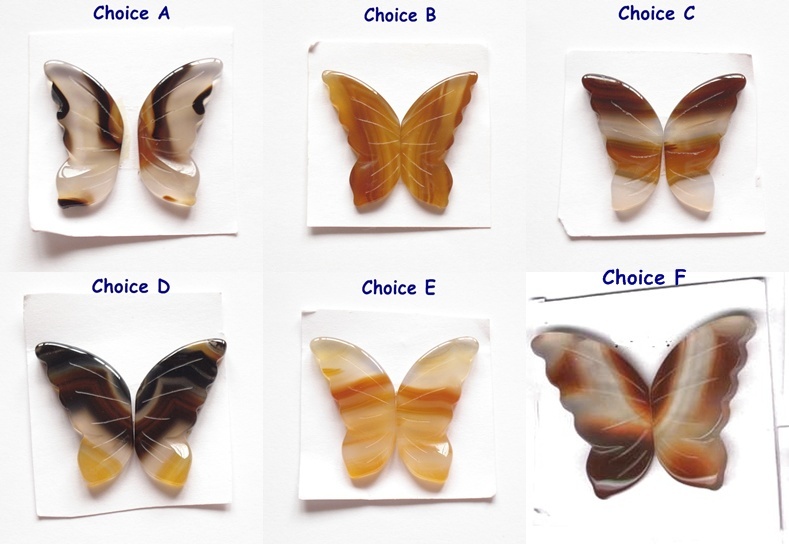 Matched pairs of high quality Agate Butterfly Wings measuring 35x28 mm (the width includes both wings). Note that each pair of wings consists of 2 loose pieces. One of a kind colors and markings. These are undrilled pieces. 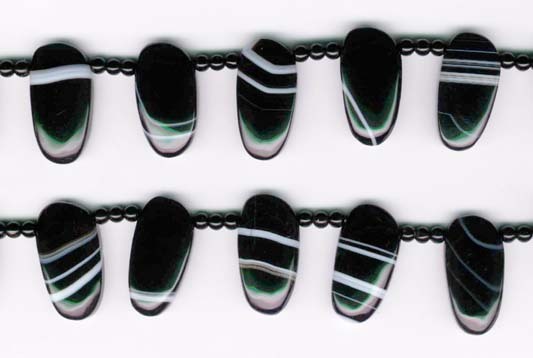 These beads have the raw edgy quality of stones as well as the elegant colors and markings typical of Botswana Agate! With stepcut facets as well as a slight twist, these beads measuring 14.6x20.5 to 32x36 mm, 16" strands . Botswana Agate is always perfect for Fall! These are in a faceted oval shape measuring 13x18 mm, 16" strands. Botswana Agate is always perfect for Fall! These are in a smooth oval shape with a slight twist measuring 13x18 mm, 16" strands. Botswana Agate is always perfect for Fall! These are in a smooth rice shape measuring 10x15 mm, 16" strands. Botswana Agate is always perfect for Fall! These are in a smooth coin shape measuring 8 mm, 16" strands. Black Banded Agate Faceted Coins measuring 15 mm, 16" strands. Green sheen is due to scanning and not actually present. Last 3 strands. Black Banded Agate Smooth Rectangles measuring around 18x25 mm, 16" strands. High quality Banded Agate in an interesting shape. These are Oval Drops measuring 16x30x6 mm interspersed with 4 mm Onyx Rounds, 16 " strands. LAST 3 strands.